» Blog Archive » You Don’t Have to Go. . .
You Don’t Have to Go. . . Sorry for the slacking. Things have been a bit busy as of late. So here’s a little gem to patch things up. I first heard this played by the very sweet, very soulful, DJ Honeydripper. We invited her on to the radio show not too long ago and she brought in a delicious box of 45rpm treats; this was one of my favorites. 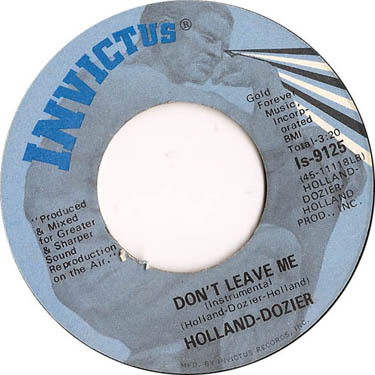 The names Holland and Dozier might not be that unfamiliar to some as the songwriting and production credits “Holland-Dozier-Holland” appears on many a Motown record. Lamont Dozier and brothers Edward Holland and Brian Holland were a hit making trio, producing and writing a number of hits for Berry Gordy during their Motown years. Tracks like Marvin Gaye’s “How Sweet it is (to be Loved by You)” and The Marvelettes’ “Please, Mr. Postman” are credited to them. This one is a track they produced and recorded from themselves. It’s the instrumental version of “Don’t Leave Me” (which I like much better than the vocal). I’ve been known to like tracks with heavier bass, but what I like how the track is how it builds; starting off with a swinging bass line complimented by the congas. As the track moves on the drums drop with the rhythm guitar and by the end the entire track is full on rocking. Listen through and enjoy. This entry was posted on Wednesday, April 30th, 2008 at 5:10 am	and is filed under Uncategorized. You can follow any responses to this entry through the RSS 2.0 feed. You can leave a response, or trackback from your own site.